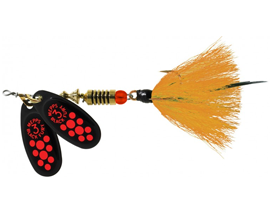 When French engineer Andre Meulnart invented the Mepps spinner in 1938, it wasn’t long before he realized it was an extremely effective fishing lure. He didn’t realize, however, he had invented a lure that would revolutionize the fishing tackle industry. It would take a World War and an unusual series of events to do that. It would also take the vision of a man who could see the lure’s full potential. Todd Sheldon discovered the Mepps spinner in 1951. Owner of a successful tackle store in downtown Antigo, Wisconsin, he was having a bad day on Wisconsin’s Wolf River. Determined to try something different, he tied on a small Mepps spinner that had been given to him by Frank Velek, a WWII GI who had returned from Europe two years earlier. Within two hours, he had creeled four trout weighing more than twelve pounds total. Todd Sheldon was hooked on and began selling Mepps spinners, but soon discovered he couldn’t get enough. Velek knew a French woman who sent spinners to the sport shop in exchange for nylon stockings. However, the lures were selling faster than she was wearing out her stockings, so Todd began buying his lures directly from Meulnart’s factory. Soon, other fishermen were experiencing catches like the one Todd took from the Wolf. But, they were catching all kinds of fish, not just trout. As the Mepps reputation grew, so did sales. In 1956, Todd sold his store and formed Sheldons’, Inc. to focus his attention on his growing import trade. By 1960, sales of Mepps spinners in the United States had topped half-a-million, and sales continued to grow rapidly. Todd set an annual sales goal of 3-million lures. “My Dad set that mark,” Sheldons’ President Mike Sheldon remembers, “because that was more than any lure had ever sold on this continent. Our sales went sailing right past that goal”. The company that started in a ten-foot-square room in the back of a small sports shop in Antigo, Wisconsin has, under the leadership of Todd and his sons Bill and Mike, become one of the most important players in the fishing tackle industry. Todd passed away in 1995. He was 81 years old. Mike has picked up the reins at Sheldons’, Inc. which now occupies a corporate headquarters encompassing almost 50,000 square feet. 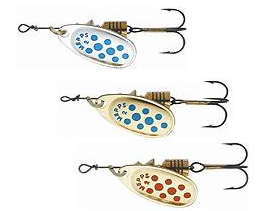 When all lure sizes, colors and hook configurations are taken into account, Mepps currently manufactures more than four-thousand different Mepps spinners and spoons. 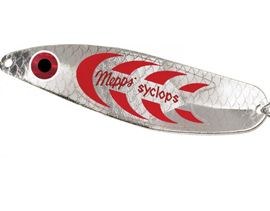 In addition, Sheldons’, Inc. now owns Mepps S.A. (Mepps France) and Mister Twister, a premium soft plastics lure company located in Minden, Louisiana. 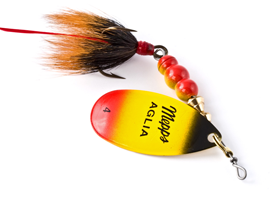 The classic Mepps spinner is the Mepps Aglia. It not only is the original French spinner, it is the original in-line spinner and it still accounts for the bulk of Sheldons’ sales. The Aglia’s “backbone” is its heavy duty stainless steel shaft. Attached to this shaft is a concave oval blade, spinner body and, of course, a hook. The blade can be silver or gold plated, polished brass, copper, or painted with computer age Epoxy. When drawn through the water, the blade rotates around the shaft creating both flash and vibration. Either will attract fish, but together they become a deadly combination game fish can’t resist. The Aglia is also flashy, decorated with plastic and/or solid brass beads in a wide variety of bright fish-attracting colors. Even the hooks can be a work of art, dressed with hand-tied squirrel or buck tail in a wide variety of colors. 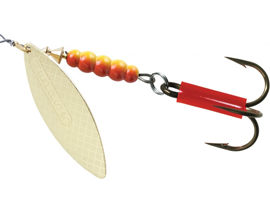 Just how the hooks on Mepps spinners have come to be dressed with squirrel tails is another Todd Sheldon-Wolf River story. Back in the early 1960’s, Todd had experienced a particularly good day trout fishing the Wolf with Mepps spinners. In fact, he had limited out! On the way back to his car, he met a young boy who also had limited out fishing with Mepps lures. But, all of the boy’s trout were larger than Todd’s. This is not something easily accepted by any fisherman. Todd noticed the Mepps spinner attached to the boy’s line had a small tuft of squirrel tail attached to the hook. When he returned to the plant, Todd began experimenting with dressed hooks. Bear hair was tried as well as fox, coyote, badger, skunk, deer, even Angus cow. But no other tail provided the pulsating action in the water created by squirrel tail or buck tail. Sheldons’, Inc. was soon recycling both squirrel and buck tails. “Squirrel Tails Wanted” reads the large carved wooden sign near the Mepps plant on Wisconsin’s Highway 45. It’s amusing to most travelers, but it intrigues others enough to stop. “This is fine with us,” Mike Sheldon smiles. “We welcome visitors and offer them tours of the plant. Hunters will also stop because they have tails to sell”. Processing the tails is a lot of work. After trimming, they are washed, not once but several times to remove every last bit of oil and grime. Between each washing they must be dried. Some are left their natural color, others are dyed brilliant hues before becoming Mepps dressed hooks. The Sheldon family has successfully fished some of the world’s most productive water all the way up to the Arctic Circle. One entire wall of Mike Sheldon’s office showcases the finest selection of trophy game fish found in North America. All of the fish were taken on Mepps lures. The requirements of staying on top of his import business has resulted in some European travel. On his visits to the factory in France, Mike will combine business with pleasure by wetting a line whenever possible. As a result, he has fished all across Europe… and with enviable results. Every fisherman has a Mepps story to tell, and anglers from all across the nation send photos of their Mepps catches to Sheldons’. Some of these unsolicited testimonials are published each year in the full-color Mepps Fishing Guide. In addition to the photos and testimonials, the Guide features the entire line-up of Mepps products and offers valuable fishing tips. The Mepps Fishing Guide is one of a very few catalogs that’s genuinely fun to read. Best of all, it’s free.